Assange was taken by UK police after the Ecuador Embassy in London withdrew sanctuary. He had sheltered there since 2012 after skipping bail, avoiding extradition to Sweden to face sexual assault charges. Trump repeatedly praised WikiLeaks during his 2016 campaign as it published e-mails, stolen by Russian military intelligence, about Democratic nominee Hillary Clinton. Some of his glowing “I Love WikiLeaks” came within hours of the website posting the hacked documents. His advisors such as Roger Stone — now facing trial on multiple charges — were in contact with Assange as WikiLeaks carrying out its operations, wittingly or unwittingly, on behalf of Moscow. 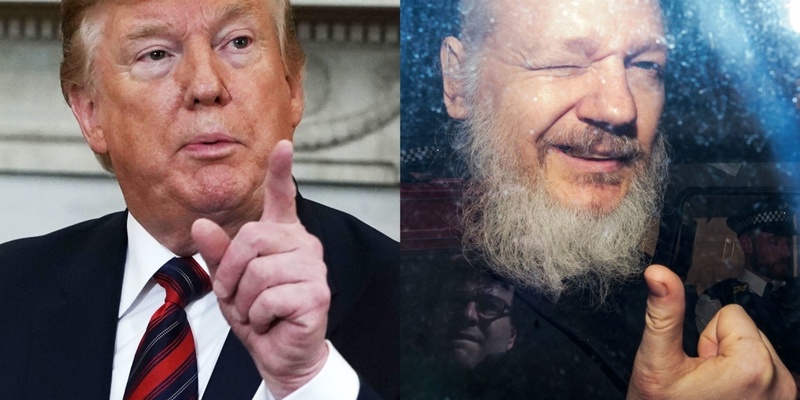 Trump’s love for WikiLeaks was overtaken by Federal prosecutors and the Justice Department’s national security division. After years of deliberation, the investigation filed a single-count sealed indictment — accidentally revealed in November — that accuses Assange of conspiring to help former Army intelligence analyst Chelsea Manning hack a Defense Department computer anonymously. By filing a lesser charge than espionage, the officials and prosecutors hope to separate Assange’s case from any claim that they are pursuing journalists and the free press. The hacking allegation carries a maximum five-year sentence. Conviction of espionage could carry 45 years, but also in theory could be filed against outlets which published the classified Government documents. Ryan Fayhee, a former official in the Justice Department’s counterespionage section, said the charge also may make it easier to extradite Assange. During the 2016 campaign, Trump’s informal advisor Stone reportedly encouraged WikiLeaks to publish the anti-Clinton e-mails and requested copies of the materials. Leading Republican legislators cautiously reacted to Trump’s disavowal of Assange. “You need to talk to the President about his comments,” said Senate Intelligence Committee chairman Richard Burr. “That’s up to the President,” Senate Judiciary chairman Lindsey Graham, a friend of Trump’s, responded. Sen. Marco Rubio, who pursued the Republican nomination in 2016, had a far different evaluation. He recalled his warning not to use the stolen material “because it was the work of a foreign intelligence agency, and it was designed to play a role in our elections”.